“Forever and Ever” is the perfect name for this urn as our love for them will truly last forever and ever. 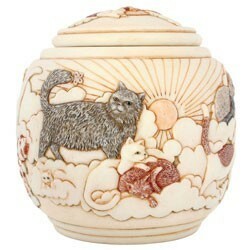 This urn is made using a special crushed marble medium resulting in an ivory look and feel. Forever and ever features a variety of gray, white, and yellow tiger cats frolicking among billowy clouds, happy and healthy once more. Created in the English Cotswolds by Ann Richmond. Closure: Top cover. May be sealed with adhesive (not included). 6" Dia. x 4.50"H Up to 20 cu. in.